I don’t know what it is about plaid that I like. I just like it. I especially like it at Christmas time. I have plaid table cloths (actually for every season), plaid Christmas plates, plaid ribbons, plaid shirts, plaid…well, you get the idea. Ten or twelve years ago, I purchased a large piece of plaid flannel at a garage sale for a couple of bucks. I knew immediately what to do with it! There is a project in this book I had been wanting to do. The flannel was perfect! The project was to make a quilt out of old flannel shirts. Flannel. Plaid. Recycle project. It just doesn’t get much better! So, I started collecting. Garage sales, Goodwill, husbands closet. We moved. Life got busy. The project stayed stuffed in a drawer until this summer–10 years later! I spent a couple of my “Craft Days with Joanna” cutting my shirts into 9 1/2 inch squares. Those squares sat in the drawer for a while before I actually started. Have I mentioned how life got busy?! Take the time to press your squares before and after all the cutting. I didn’t have a layout pattern. I just laid the pieces on the floor and moved them around until I was happy. Chain-piecing the squares made the sewing go more quickly. Disclaimer: This is not ACTUALLY a quilt. It is really more of a coverlet. A quilt has 3 layers-top, batting, back. My coverlet just has a top and back-for several reasons. First, I thought with an all-flannel front and an all-flannel back that it might be too warm. Second, I didn’t have enough batting at the time. I was ready to finally be finished with this project. I didn’t want a trip into the big city to slow me down. Third, I didn’t want to do a lot of quilting. My “quilt” is just tacked together with buttons from the shirts and other various projects. I didn’t do a fancy binding or border either. Here is the back of the quilt. (Yes, I know, it just is easier than coverlet.) This is the large piece of plaid flannel that started it all! I’m so happy to have this little project finished! I even finished it in time for the county fair. Blue ribbon! In hind-sight, I wish I had added the batting and the border. Oh, well! I’m happy enough with it. I do love it’s plaid-ness! 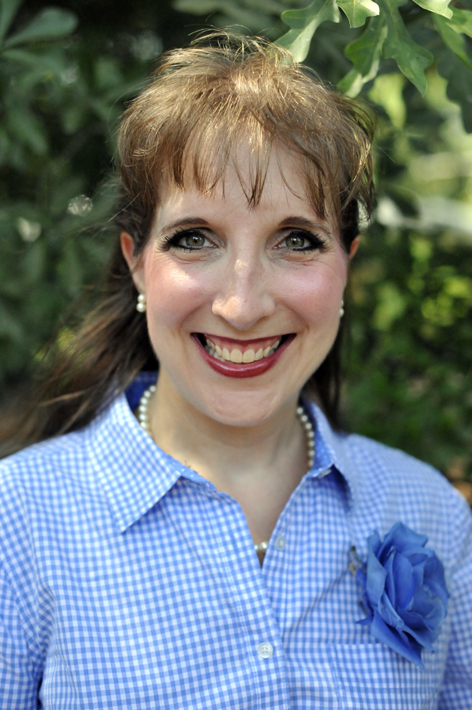 I am a member of a group called Arkansas Women Bloggers. 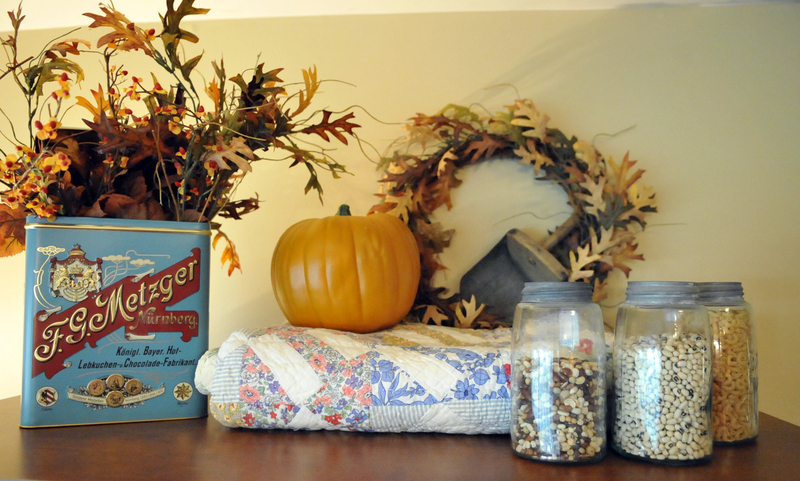 This week the group is hosting a challenge called BLOGtober Fest. Each day this week there is a different topic to blog about. I’ve never been part of one of these challenges, so I thought I’d give it a try. 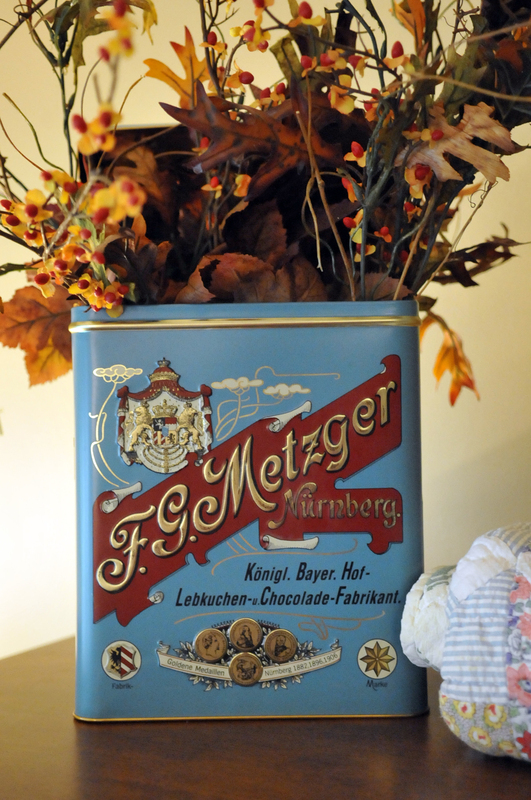 Click on the BLOGtober Fest picture to see who else is participating this week. 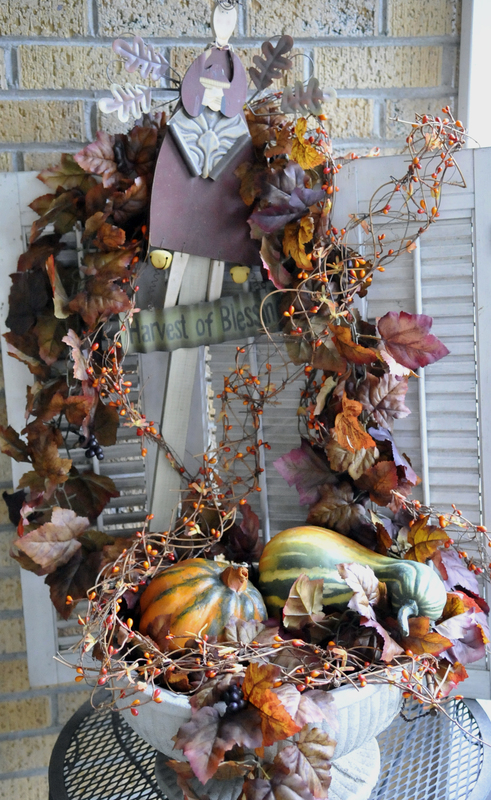 Today’s challenge is Fall Fashion and Decor. 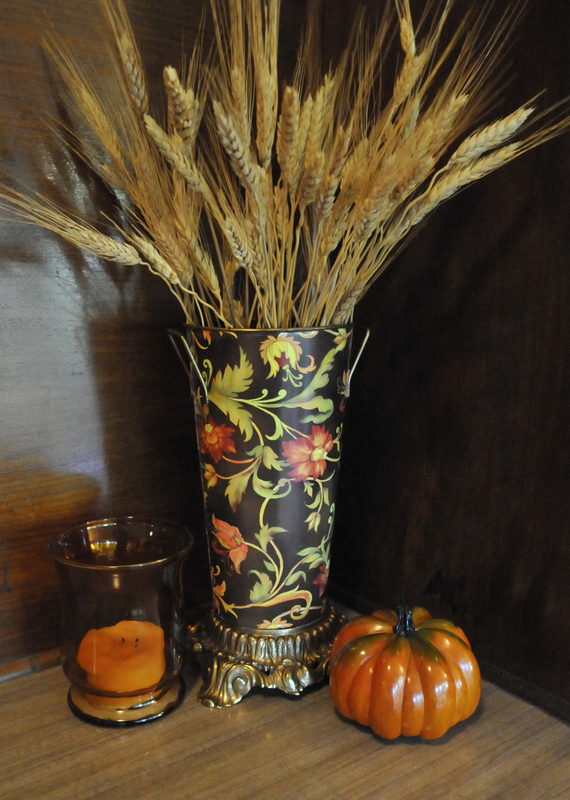 Well, we all know how my fashion posts turn out, so I opted for the Fall Decor. We haven’t had the chance to go to a pumpkin patch this year. I haven’t bought any mums either. I started to get some at Lowe’s the other day, but they didn’t have the color I wanted in the size I wanted. Guess I’ll get them another day. One of my favorite fall “pretties” is bittersweet! I don’t think I have ever seen the real deal, but I sure like the artificial. I picked up these shutters curb-side one day. There are two more just like these on either side of my bathroom mirror. The planter was a freebie, too. 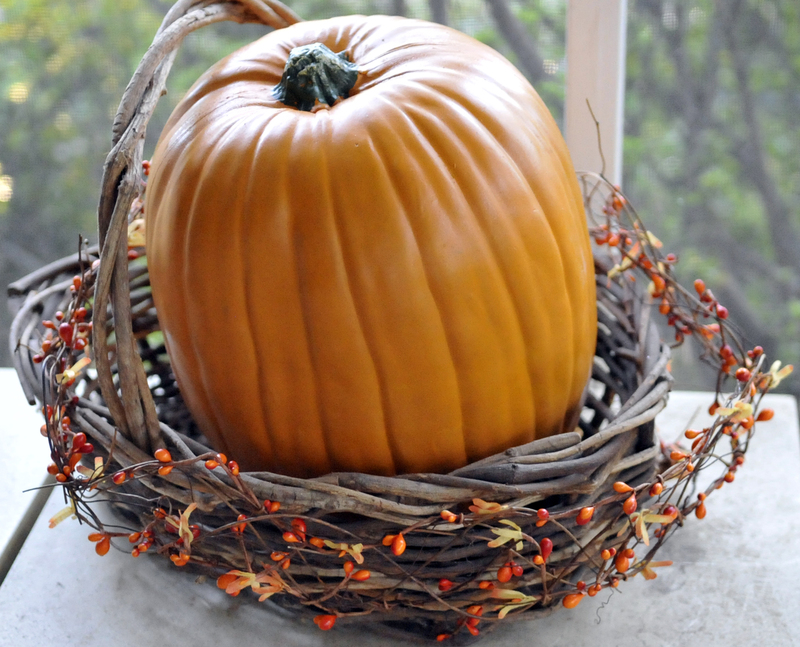 Yes, this is a fake pumpkin. I LOVE pumpkins-fake or real. I like this little plaque. I think I like it because “y’all” is punctuated correctly! 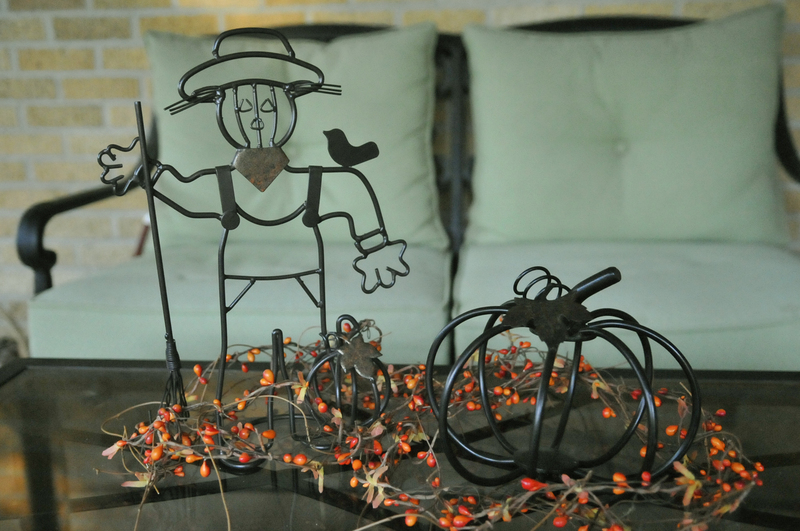 The metal scarecrow and pumpkin are quite happy on the porch this year. Wow! That is an ORANGE picture! The Indian corn is actually my wreath that has gotten quite lopsided. I think it works just fine with a candle in the middle. 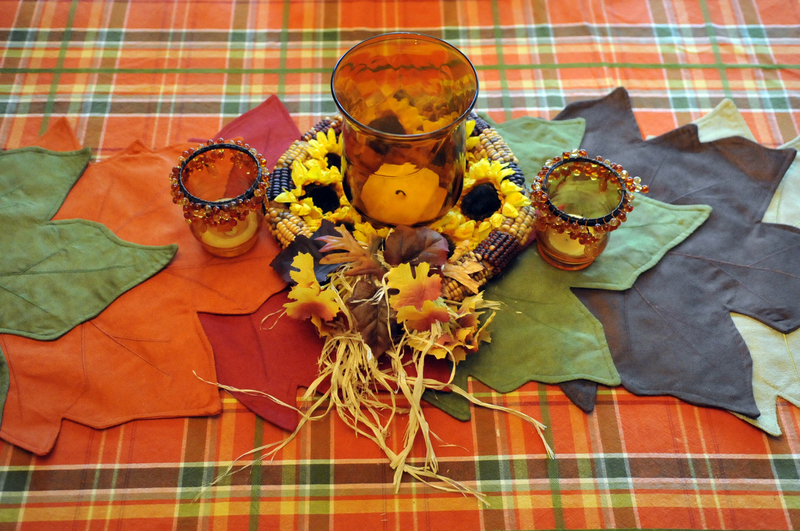 I love my leaf placemats–Walmart special! On top of the entertainment cabinet is a favorite place for decorations. I went a little country this year. Isn’t the blue tin great! My in-laws brought it back for us from one of their trips to Germany. It was full of yummy cookies! 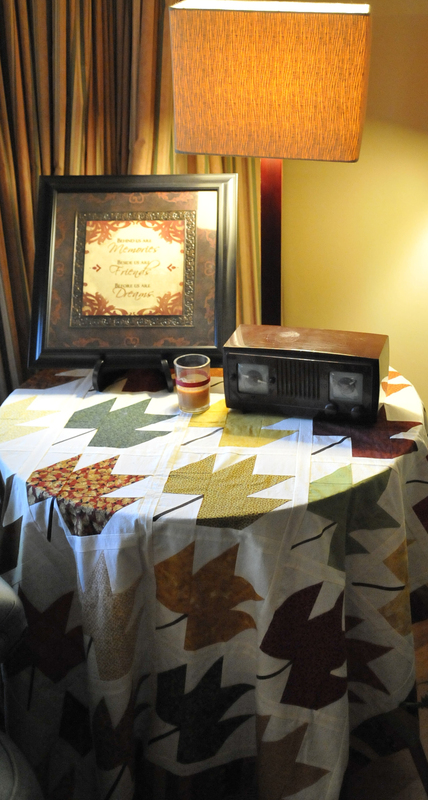 A quilt top, covering a small accent table in the den, hides DVDs and Wii games. Now you know. 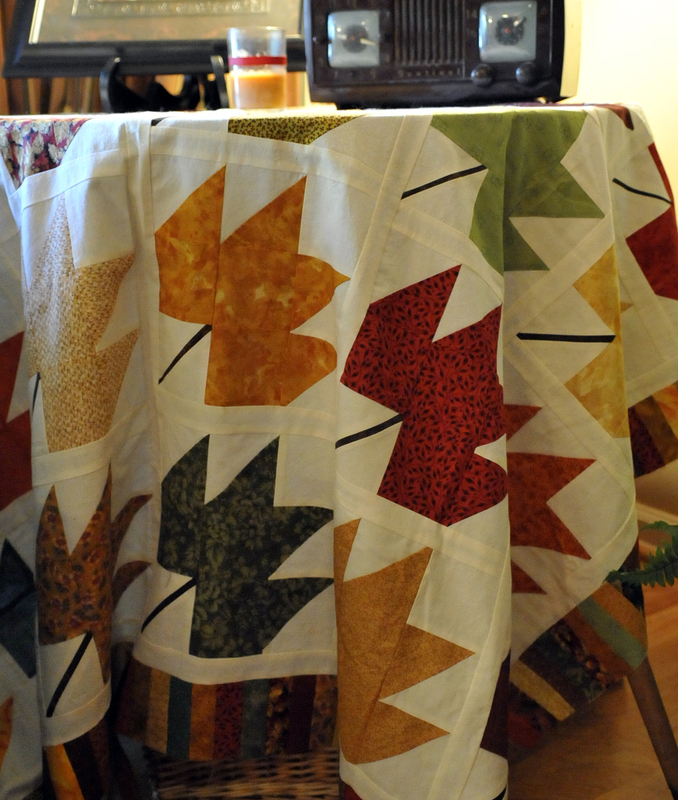 I actually made the maple leaf quilt top. One of these days maybe I’ll actually QUILT it! Every leaf is different. 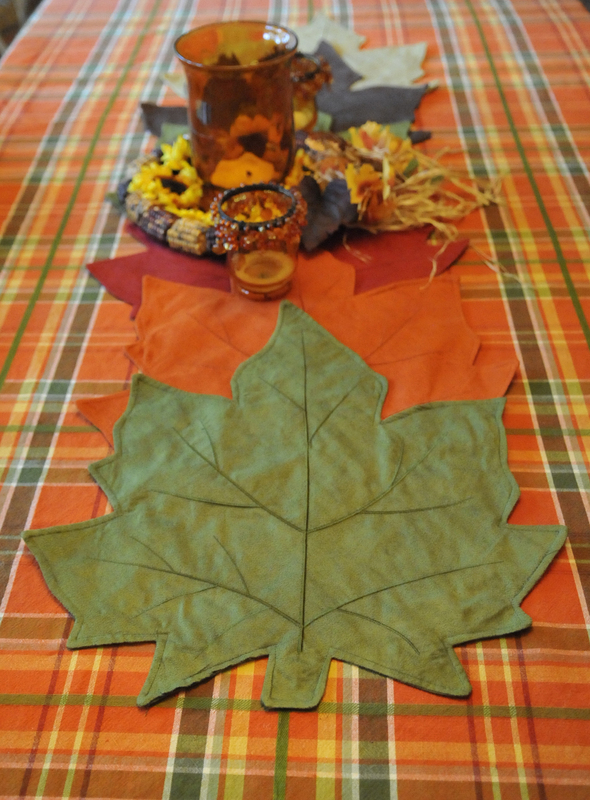 I especially like the border made from all the leaf fabrics. 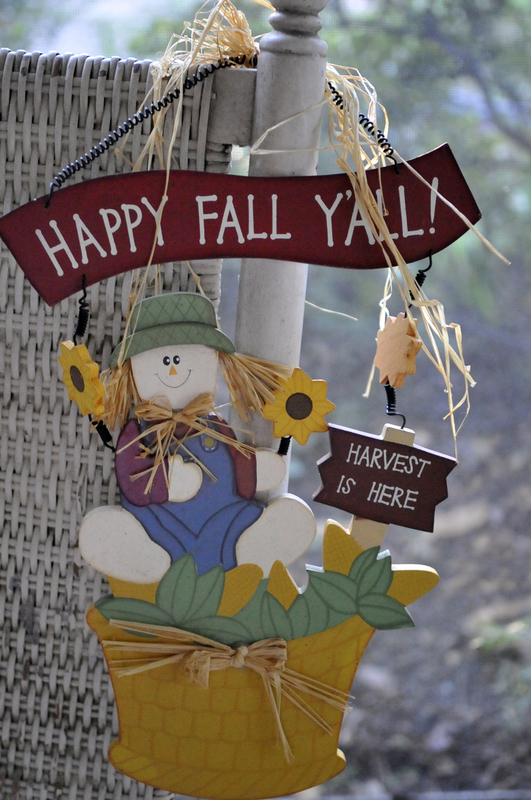 This was an inexpensive decoration. The “runner” is actually two 10¢ placemats from Goodwill. The bowl is from Goodwill too. I think it was $1. 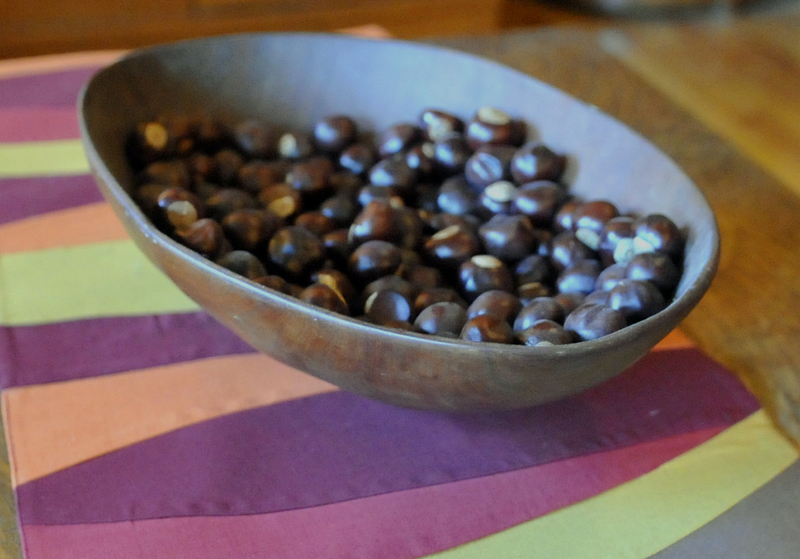 Several years ago, we had a blast opening buckeyes from a nearby buckeye tree. I think they look pretty in the bowl. They are fun to play with, too. Here is a sad little story. I bought four of these acorn plates a couple of years ago in a sale bin. Last year, I was excited to set them out with my china and crystal–kind of a country life meets city life look, I suppose. I was so happy with how they looked in the china hutch. I just wasn’t happy with how they sounded. 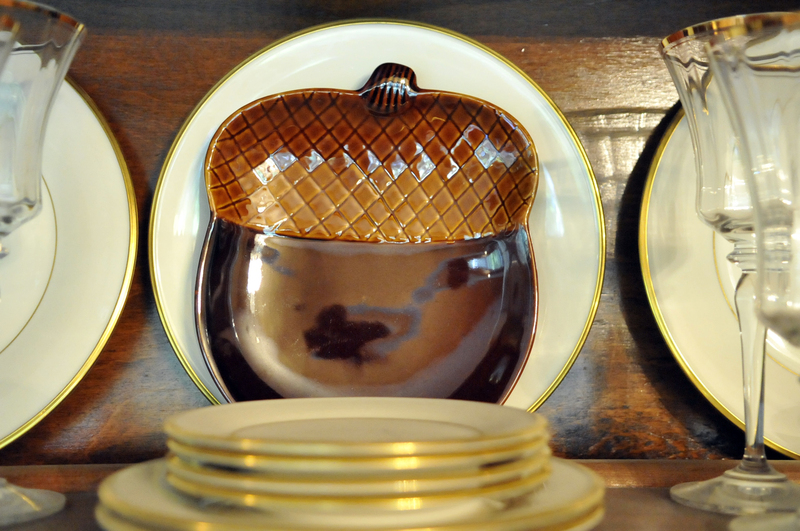 The sweet little acorn plates toppled over, careening into the china and crystal. There was a large CRASH! followed by the tinkling of the wedding crystal as it made its way to the floor. I had no one to blame but myself. I’m not sure what I’ll be doing with these little plates this year. Maybe we should just eat off of them! 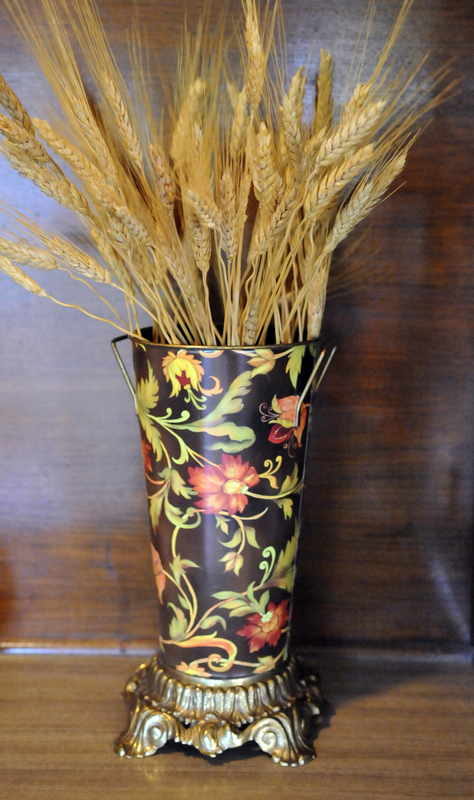 Wheat in a decorative bucket. I had an old punch bowl base sitting around. It worked great to give my wheat a boost. Okay, it is actually an anytime decoration. 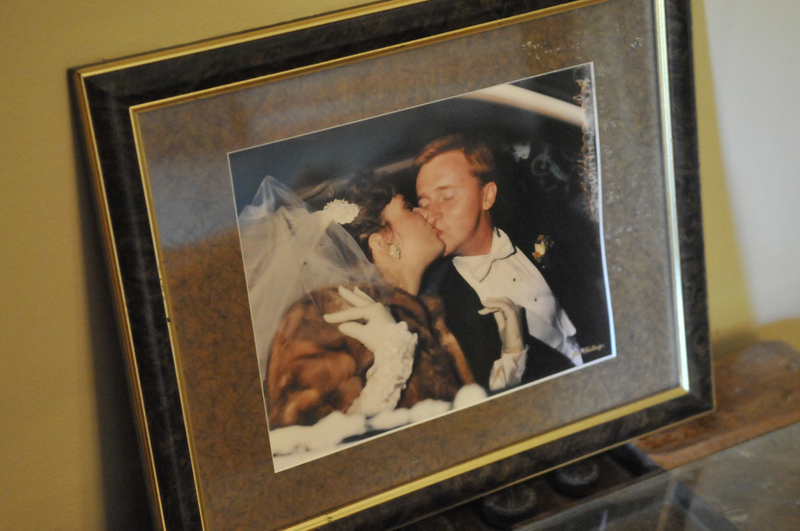 Me and my hubby on our wedding day–the weekend after Thanksgiving! Tune in daily this week to see if I make it through the blogging challenge! Haha! Be sure you visit the others who have taken on the challenge as well!